We previously demonstrated that NK cells from HIV-infected individuals have elevated expression of activation markers, spontaneously degranulate ex vivo, and decrease expression of a signal-transducing protein for NK-activating receptors, FcRγ. Importantly, these changes were maintained in virologically suppressed (VS) individuals receiving combination antiretroviral therapy (cART). 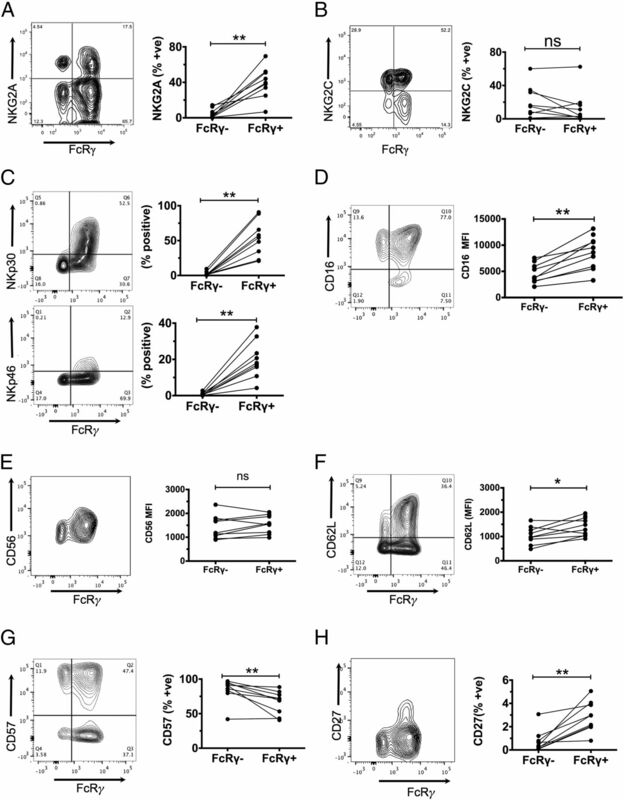 In this study, we show that loss of FcRγ is caused by the expansion of a novel subset of FcRγ−CD56dim NK cells with an altered activation receptor repertoire and biological properties. In a cross-sectional study, FcRγ− NK cells as a proportion of total CD56dim NK cells increased in cART-naive viremic HIV-infected individuals (median [interquartile range] = 25.9 [12.6–56.1] compared with 3.80 [1.15–11.5] for HIV− controls, p < 0.0001) and in VS HIV-infected individuals (22.7 [13.1–56.2] compared with 3.80 [1.15–11.5], p = 0.0004), with no difference between cART-naive and VS patients (p = 0.93). FcRγ− NK cells expressed no NKp30 or NKp46. They showed greater Ab-dependent cellular cytotoxicity activity against rituximab-opsonized Raji cells and in a whole-blood assay measuring NK responses to overlapping HIV peptides, despite having reduced CD16 expression compared with conventional NK cells. Their prevalence correlated with CMV Ab titers in HIV− subjects but not in HIV+ individuals, and with the inflammatory marker CXCL10 in both groups. The expansion of a subset of NK cells that lacks NKp30 and NKp46 to ∼90% of CD56dim NK cells in some VS HIV+ individuals may influence NK-mediated immunosurveillance in patients receiving cART. Combination antiretroviral therapy (cART) reduces HIV viremia in peripheral blood to levels undetectable by standard clinical assays (<20 copies HIV RNA/ml) and reduces the incidence of AIDS and associated mortality. However cART does not eliminate HIV infection, and treated individuals experience elevated rates of non-AIDS comorbidities including non-AIDS cancers such as Hodgkin’s lymphoma and solid tumors (1), demonstrating that cART does not fully restore functional immunity. Understanding why immune defects persist in HIV+ individuals receiving cART will facilitate adjunctive therapies to improve long-term health outcomes in HIV-infected individuals. We and others have shown activation of the innate immune system in patients who achieve virologic suppression on cART, exemplified by elevation of phenotypic and plasma markers of activation related to innate immune cells, notably monocytes/macrophages (2–8). “Elite controllers” (HIV+ individuals who control HIV viremia without ART) also display innate immune activation (9), suggesting it may be independent of HIV viremia and cART. Instead, the causes may include residual HIV replication in tissues (10, 11), reactivation of latent viruses such as CMV (12, 13), and/or the presence of circulating bacterial products due to loss of gut integrity (4). NK cells are innate lymphoid cells (14) that kill transformed and virus-infected cells via perforin/granzyme and Fas/FasL-dependent mechanisms. Human NK cells are divided into subsets defined by expression of CD56 (NCAM-1), an adhesion molecule that participates in homotypic interactions, and CD16 (FcγRIIIa), an activating receptor for IgG-promoting Ab-dependent cellular cytotoxicity (ADCC). CD56brightCD16− NK cells are less mature and constitute a minor subset in circulation but more prominent in secondary lymphoid tissues (15). They have relatively poor cytotoxic activity but are robust producers of inflammatory cytokines and chemokines in response to cytokine stimulation. CD56dimCD16+ NK cells are more mature, secrete inflammatory cytokines such as IFN-γ in response to cytotoxic targets, and are more abundant in circulation. They exhibit cytotoxic and CD16-dependent ADCC activity. In chronic viral infections, such as HIV, a senescent population of CD56− NK cells accumulates in circulation (16, 17). These cells proliferate poorly, have limited cytotoxic ability and proinflammatory cytokine secretion, but retain the ability to secrete chemokines such as CCL4 (18, 19). NK activation receptors signal via small adaptor proteins containing ITAM motifs, namely TCRζ, FcRγ, and DAP12 (20). ITAM motifs on these proteins are phosphorylated following engagement of the activation receptors and act as docking sites for spleen tyrosine kinase and ZAP70, which in turn activate downstream signaling pathways such as those required for cytokine production and degranulation (21). The ITAM-containing signaling proteins also act as chaperones and are essential for surface expression of their cognate activating receptors. The role of NK cells as antiviral effectors has prompted studies into how their numbers, subset distribution, phenotype, and activity are altered in HIV disease. NK cell numbers increase during acute HIV infection largely due to expansion of the CD56dim subset (22), whereas the numbers of CD56bright NK cells appear to be relatively unaffected (16). Viremic HIV disease is characterized by expansion of CD56− NK cells, which disappear in virologically suppressed (VS) individuals receiving cART (23). HIV infection is also characterized by the loss of NKG2A+ NK cells and increases in NKG2C+ NK cells (24). Both NKG2A and NKG2C form heterodimers with CD94 and recognize HLA-E; however, the NKG2A heterodimer is an inhibitory receptor whereas the latter promotes activation. Although changes in the proportion of NKG2A and NKG2C+ NK cells are independent of viral load (24), they may be driven by CMV and were reversed following virologic suppression on cART (25). 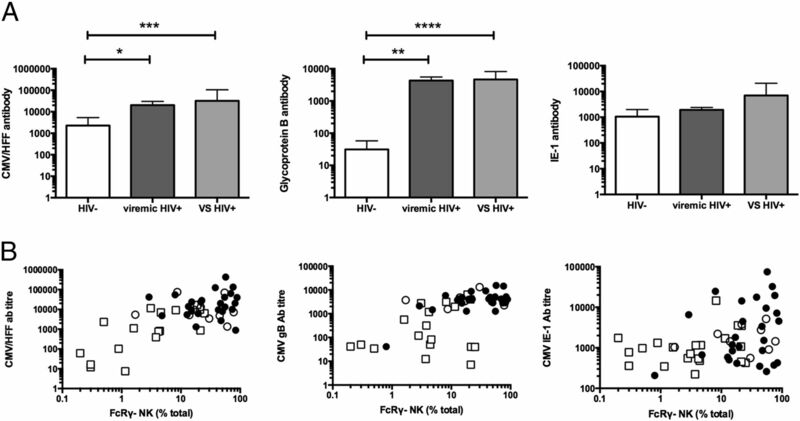 NK natural cytotoxic activity against the heterologous target cell K562 is decreased in viremic HIV infection but was restored in one study following virologic suppression within 24 wk of initiating cART (26). Whereas HIV viremia is usually well managed by cART, patients retain innate immune activation and inflammation that may influence NK activity and function. We have shown that their NK cells express elevated phenotypic markers of cell activation, spontaneously degranulate ex vivo, and have altered signal transduction, which persist following virological suppression (27, 28). In particular, HIV infection was associated with a significant decrease in expression of FcRγ manifest at both the protein and mRNA levels. In the present study, we show that loss of FcRγ in HIV-infected individuals is due to expansion of an FcRγ−CD56dim NK subset that persists in VS individuals and represents up to 90% of the total CD56dim population. We compare the phenotype of FcRγ− and conventional NK cells and investigate the role of CMV and inflammation in their expansion in HIV+ individuals. HIV-seropositive individuals were recruited and blood was taken with informed consent by research staff in the Department of Infectious Diseases, Alfred Hospital (Melbourne, VIC, Australia). Ethical approval was obtained from the Alfred Hospital Research and Ethics Committee. Study subjects included 10 persons not currently receiving cART (mean [SD] viral load = 72,351 [47,565], range = 17,500–153,200 copies/ml), 33 persons receiving cART at the time of sampling (1 with a viral load of 150 copies/ml and the remainder with a viral load of ≤50 copies/ml). As controls, 23 HIV-seronegative control subjects were recruited from the community and blood was taken by an experienced phlebotomist. CD3 PerCP-Cy5.5 (clone UCHT1), CD16 PE-Cy7 (clone 3G8), CD336 PE (clone p44-8.1), CD107a allophycocyanin-H7 (clone H4A3), TNF PE (clone Mab11), and IFN-γ Alexa Fluor 488 (clone B27) were from BD Biosciences; CD3 Alexa Fluor 700 (clone UCHT1), CD3 BV510 (clone OKT3), CD56 Alexa Fluor 700 (clone HCD 56), CD314 PE (clone 1D11), CD57 Pacific Blue (clone HCD57), CD335 PerCP-Cy5.5 (clone 9E2), and CD337 Alexa Fluor 647 (clone P30-15) were from BioLegend; CD56 allophycocyanin (clone N901/HLDA6), CD159a allophycocyanin (clone Z199), and TCRζ PE (clone 2H2D9) were from Beckman Coulter; CD159c PerCP (clone 134591) was from R&D Systems; and FITC-conjugated rabbit polyclonal Ab to FcRγ (Milli-Mark, anti-FcεR1 Ab, γ subunit–FITC, catalog no. FCABS400F) was from Millipore. Cells and plasma were prepared from whole blood collected into EDTA anticoagulant tubes and PBMC were prepared by Ficoll density gradient centrifugation. Cells (1 × 106) were stained with appropriate cell surface markers (CD3, CD56, and CD16) for 30 min on ice, permeabilized (Perm/Wash buffer 1, BD Biosciences), and stained for FcRγ or TCRζ for 30 min on ice, then washed (Perm/Wash buffer 1, BD Biosciences) and fixed. Phenotyping of NK cell subsets was performed by staining with desired cell surface markers or relevant isotype controls, plus the lineage markers detailed above, before intracellular staining. CD107a mobilization in response to CD16 cross-linking was measured as described previously (21). Briefly, CD16 was cross-linked by the addition of 5 μl (5.5 μg) anti-CD16 (clone 3G8, donated by Mark Hogarth, Burnet Institute, Melbourne, VIC, Australia) to 100 μl whole blood and incubation on ice for 10 min. Cells were washed once with ice-cold PBS, incubated with 8 μl goat anti-mouse F(ab′)2 fragment (55487, ICN Pharmaceuticals/Cappel, Costa Mesa, CA) for a further 5 min, and then transferred to a 37°C water bath for the remainder of the incubation. To measure TNF production, 5 × 105 PBMC were incubated in 1 ml RF10 (RPMI 1640 containing 10% newborn calf serum [HyClone, Cosmic Calf serum], 100 U/ml pencillin/streptomycin [Life Technologies], and 2 mM l-glutamine) with an equal number of Raji cells either unopsonized or opsonized with 10 ng/ml rituximab. One hundred microliters RF10 containing anti–CD107a-allophycocyanin-Cy7, 20 μg/ml brefeldin A, and 10 μM monensin was added and the cells were incubated for 4 h at 37°C, stained with anti–CD3-PerCP-Cy5.5, anti–CD16-PE-Cy7, and anti–CD56-allophycocyanin (30 min on ice) and then permeabilized (Perm/Wash buffer 1, BD Biosciences). After 10 min on ice, cells were blocked for a further 10 min using 10 μl rabbit serum plus 10 μl mouse serum and then stained with anti–TNF-PE and rabbit anti–FcRγ-FITC for 30 min, washed, and fixed. ADCC activity against peptide-pulsed target cells was also measured in a whole-blood assay (29). Briefly, 150 μl fresh whole blood was pulsed with 1 μg/ml of an envelope peptide pool (15 aa each with 11 aa overlap: subtype B, strain MN, National Institutes of Health AIDS Reagent Program) and 25% serum from a single HIV+ donor showing high ADCC activity, in the presence of anti–CD107a-allophycocyain-Cy7 (BD Biosciences), 10 μg/ml brefeldin A (Sigma-Aldrich), plus 5 μM monensin (GolgiStop, BD Biosciences). After 5 h, cells were stained with anti–CD3-PerCP and anti–CD56-PE-Cy7 and then permeabilized (FACS Perm II, BD Biosciences) and stained for FcRγ. Plasma concentrations of soluble CD163 (Macro 163, Trillium Diagnostics), CXCL10 (CXCL10/IP-10 Quantikine ELISA, R&D Systems), and IFN-α (human IFN-α [pan specific] ELISAPRO, Mabtech) were measured using commercial ELISA kits according to manufacturers’ instructions. High-sensitivity C-reactive protein (hsCRP) was measured using the Abbott Architect ci16200 (Abbott Laboratories) by the Alfred Pathology Service, Alfred Hospital (Melbourne, VIC, Australia). Selected plasma samples were screened for CMV DNA using the COBAS AmpliPrep/COBAS TaqMan CMV test by the Alfred Pathology Service, Alfred Hospital (Melbourne, VIC, Australia). IgG reactive with CMV was quantified using CMV lysate, CMV glycoprotein B (CMVgB), and CMV immediate early Ag-1 (CMVIE-1) Ags. CMV lysate was prepared by sonication of human foreskin fibroblasts (HFF) infected with CMV strain AD169. Uninfected HFF were prepared and extracts were analyzed in parallel. Replicate ELISA plates were coated with CMVgB (produced in hamster ovary cells, Chiron, 2800-800; 50 ng/ml) and CMVIE-1 (produced in Escherichia.coli, Miltenyi Biotec, 130-092-137; 2500 ng/ml). Plasma samples were diluted from 1:200. Binding was detected using goat anti-human IgG–conjugated horse radish peroxidase, followed by tetramethylbenzidine substrate (Sigma-Aldrich). Reactions were stopped with 1 M H2SO4 and measured at 450 nm. Four-parameter logistic curves were generated from titrations of a plasma sample assigned a value of 1000 arbitrary units IgG reactive with each Ag using SoftMax Pro version 5.4 software. The standard was run on each plate and unit values were derived for all samples. The standard curve of the positive plate was used to generate units of Ab on plates coated with uninfected HFF. These were subtracted from those generated using CMV-coated plates. Total IgG was quantified using plates coated with polyvalent goat anti-human IgG (2.5 mg/ml; Invitrogen) diluted 1:500 in bicarbonate buffer and blocked with 5% BSA in PBS for 60 min. Plasma samples were diluted from 1:100,000 in 2% BSA/PBS and applied for 120 min. Binding was detected using goat anti-human IgG–conjugated HRP (Sigma-Aldrich) followed by tetramethylbenzidine substrate as described above. Comparisons between HIV− and HIV+ groups were made using a nonparametric Mann–Whitney U test. Differences in properties of FcRγ− and conventional NK cells within HIV+ patients and controls were assessed using a paired Wilcoxon signed rank test. To measure the association between inflammatory biomarkers or CMV Abs and the proportion of FcRγ− NK cells, data were log transformed (where required) to achieve a normal distribution (D’Agostino–Pearson omnibus normality test), and Pearson correlation coefficients were determined from the transformed data. Lines of best fit were computed separately using data from HIV− and HIV+ individuals and their slopes were compared. All analyses were performed using GraphPad Prism, version 6.0. We have previously reported that FcRγ expression in NK cells from HIV+ individuals is decreased irrespective of CD4 T cell count or HIV viral load (21, 27, 28). To identify the reason for this decrease, we examined expression of FcRγ and the functionally related signaling molecule TCRζ in NK cell subsets. In healthy control subjects, CD56dim and CD56bright NK cells expressed both FcRγ and TCRζ (Fig. 1A, red and gray contour plots, respectively). The FcRγ−CD56dim cells were further characterized as NK cells because they also lacked expression of monocyte (CD14), T cell (CD3), and B cell (CD19) markers (Supplemental Fig. 1). The level of FcRγ expression coincided with negative staining using control FITC-conjugated rabbit IgG (Supplemental Fig. 1) and with the level of staining in CD3+ T lymphocytes, most of which do not express FcRγ (not shown). The expression of FcRγ and TCRζ was correlated in both NK cell subsets, but it was lower in the CD56bright NK cells. We also examined FcRγ expression in monocytes and showed that expression was elevated in both subsets defined by CD16 (nonclassical and intermediate) compared with classical monocytes, whereas all three subsets had comparable expression of TCRζ (Supplemental Fig. 2). In HIV+ subjects, CD56dim NK cells showed two populations that differed in either expressing or not expressing FcRγ while having equivalent levels of TCRζ expression (Fig. 1B, red contour plot). In contrast, FcRγ expression was normal in the CD56bright population (Fig. 1B, gray contour plot). These data show that HIV infection was associated with the selective loss of FcRγ expression in CD56dim NK cells. We next examined the prevalence of FcRγ−CD56dim NK cells (gated as shown in Fig. 1C and hereafter called FcRγ− NK cells) in a cross-sectional study comprising 23 HIV−, 10 viremic HIV+, and 33 VS HIV+ individuals (Table I). The FcRγ− population was greatly expanded in viremic HIV+ individuals compared with HIV-uninfected individuals (median [interquartile range, IQR] = 25.9 [12.6–56.1] compared with 3.80 [1.15–11.5], p = 0.0009) and remained unchanged following virologic suppression (median [IQR] = 22.7 [13.1–56.2], p < 0.0001 compared with HIV-uninfected and p = 0.927 compared with HIV+ viremic) (Fig. 1D). We examined FcRγ expression in all three monocyte subsets in a subset of the study participants and found no differences (Supplemental Fig. 3A). We also determined that TCRζ expression was unchanged by HIV infection in monocytes (Supplemental Fig. 3B) and in CD56bright and CD56dim NK cells (Supplemental Fig. 3C). Considered together, these data support the conclusion that HIV infection selectively affects FcRγ expression in NK cells. NK cells in PBMC from a representative HIV− donor (A) and a VS HIV+ donor (B) were analyzed for expression of FcRγ and TCRζ. Lymphocytes were gated on forward versus side scatter plots (top left) and NK cell subsets were gated on CD56 versus CD3 dot plots (top right). Coexpression of FcRγ and TCRζ were measured in CD56bright NK cells (gray contour plots) and in CD56dim NK cells (red contour plots) (bottom panels). (C) Gating strategy for determining the proportion of FcRγ−CD56dim NK cells is shown for a VS HIV+ donor with very few conventional FcRγ+ NK cells. (D) FcRγ expression was assessed in CD56dim NK cells [gated as indicated in (C)] and the proportions of FcRγ−CD56dim NK cells were measured in 23 HIV− controls, 10 viremic HIV+, and 33 VS HIV+ individuals. Groups were compared using the Mann–Whitney U test. ***p < 0.001, ****p < 0.0001. ns, p = 0.93. The proportion of FcRγ− NK cells in VS HIV+ individuals did not correlate with their duration of ART (Pearson’s r = −0.099 p = 0.589). Neither was there any correlation with current CD4 (r = −0.134, p = 0.415) or nadir CD4 (r = −0.017, p = 0.916) counts. FcRγ-deficient NK cells are present in low abundance in otherwise healthy blood donors who are seropositive for CMV (30). CMV seropositivity is >90% among HIV patients and may be used as a marker of their historical burden of CMV. In the present study, we measured Ab responses by ELISA using a lysate of CMV-infected fibroblasts (HFF), CMVgB, and the latency-associated CMVIE-1. HIV+ individuals had elevated levels of Ab to CMV lysate and gB, but not to IE-1 (Fig. 2A). Because CMV reactivation can increase with age, and the median age of VS HIV+ individuals in our cohort was older than viremic HIV+ or uninfected individuals (Table I), we analyzed CMV Abs in a subset of participants aged ≤45 y to determine whether the above-mentioned effect was influenced by age. This analysis confirmed increased levels of Abs to both CMV HFF lysate (p = 0.003) and gB (p < 0.001) in VS HIV+ individuals as compared with controls of a similar age (Table II). Although there was a trend toward higher levels of total IgG in plasma from HIV+ individuals (0.077 and 0.059 for viremic and VS, respectively), these differences were not significant, suggesting that the increase in Abs to CMV is not solely attributed to hypergammaglobulinemia. The percentage of FcRγ− NK cells correlated strongly with the levels of Ab to HFF (Pearson’s r = 0.676, p < 0.0001) and gB (r = 0.597, p < 0.0001) and moderately with IE-1 (r = 0.343, p = 0.0091) (Fig. 2B). However, when subjects were stratified according to their HIV status, there was a significant correlation between total CMV lysate Ab and FcRγ− NK cells in controls (r = 0.759, p = 0.0002) but not in HIV+ subjects (r = 0.024, p = 0.90). We also performed linear regression analysis on the relationship between FcRγ− NK cells and HFF Ab levels and adjusted this model for age. This analysis confirmed significantly higher levels of CMV Abs in viremic and VS HIV+ individuals (p = 0.002 and 0.015, respectively), independent of age. (A) Levels of Abs to whole-cell lysate of CMV-infected HFF, envelope gB, and IE-1 were measured by ELISA in plasma from HIV− control subjects (HIV−), viremic HIV+ individuals, and VS HIV+ individuals. Histograms represent median (IQR), and differences between groups were assessed using a Mann–Whitney U test. *p < 0.05, **p < 0.01,***p = 0.001, ****p < 0.0001. (B) The relationship between Ab levels to CMV Ags measured in plasma and the proportion of FcRγ−CD56dim NK cells in each subject was determined using Pearson’s correlation (□, HIV− subjects; ○, viremic HIV+; ●, VS HIV+). We next measured plasma markers of inflammation (CXCL10, soluble CD163, hsCRP, soluble TNFR), and IFN-α. In this small cross-sectional group soluble CD163 and CXCL10 were significantly elevated in viremic HIV+ individuals and remained elevated in VS patients (2), whereas hsCRP, soluble TNFR, and IFN-α were not significantly different (Fig. 3A–E). Only CXCL10 correlated with the prevalence of FcRγ− NK cells (Pearson’s r = 0.550, p < 0.0001; Fig. 3F). Similarly, there was a strong correlation between CXCL10 and FcRγ− NK cells in HIV− individuals (r = 0.579, p = 0.015) but the correlation in HIV+ individuals did not reach significance (r = 0.313, p = 0.060). It is of interest that, although elevated in HIV+ individuals, there was no relationship between FcRγ− NK cells and soluble CD163. (A–E) Levels of the indicated inflammatory and immune activation markers were measured by ELISA in plasma from study subjects. Error bars represent median ± IQR. Differences between groups were assessed for significance using the Mann–Whitney U test. *p < 0.05, **p < 0.01,***p = 0.001. (F) The relationship between plasma CXCL10 levels and the proportion of FcRγ−CD56dim NK cells in each subject was determined using Pearson’s correlation (□, HIV− subjects; ○, viremic HIV+; ●, VS HIV+). FcRγ expression is associated with CD16-dependent ADCC activity (21); therefore, we compared ADCC activity in FcRγ− and conventional NK cells. PBMC from VS HIV+ individuals were exposed to rituximab-opsonized or nonopsonized Raji cells and degranulation was assessed using cell surface CD107a. FcRγ− NK cells showed greater degranulation in response to both nonopsonized and rituximab-opsonized Raji cells (Fig. 4A). To confirm these findings, NK degranulation and IFN-γ production in response to a HIV peptide pool were measured in whole blood from VS HIV+ individuals (29). The assay was modified to gate on FcRγ− and conventional NK cells. FcRγ− NK cells degranulated and produced more IFN-γ in response to overlapping HIV peptide pools than did conventional NK cells (Fig. 4B). Overall, FcRγ− NK cells present in HIV+ individuals have higher ADCC activity than do conventional NK cells. (A) PBMC prepared from eight VS HIV+ individuals (median age [range] = 52.5 [34–70] y), chosen because they exhibited ∼50% FcRγ−CD56dim NK cells, were incubated with Raji (top panel) or rituximab-opsonized Raji (bottom panel) cells at an E:T ratio of 1:1. CD107a expression on both FcRγ− and conventional (FcRγ+) CD56dim NK cells was measured as described in Materials and Methods. (B) Freshly sampled whole blood from seven VS HIV+ individuals (additional to those described in Table I) was incubated with a pool of overlapping HIV envelope peptides and serum from a single ADCC responder as described in Materials and Methods and then surface expression of CD107a and intracellular IFN-γ levels in both FcRγ− and conventional NK cells was measured by flow cytometry. Top panels show the contour plots from a representative donor indicating CD107a (left) and IFN-γ expression (right) versus FcRγ. Aggregate data for all seven donors are shown in the bottom panels. (C) Whole blood from 10 HIV− and 10 VS HIV+ donors was incubated for 4 h at 37°C then CD107a expression was measured in FcRγ− and conventional (FcRγ+) CD56dim NK cells as described in Materials and Methods. In the left panel, a comparison of CD107a expression on total CD56dim NK cells between HIV− and HIV+ donors is shown. In the right panel, CD107a expression on FcRγ− and conventional (FcRγ+) CD56dim NK cells from VS HIV+ donors is shown. (D) CD38 and HLA-DR expression in FcRγ− and conventional NK cells was measured in whole blood collected from eight VS HIV+ donors. HLA-DR versus CD38 contour plots from FcRγ− (red) and conventional (gray) CD56dim NK cells from a representative donor are shown in the left panel, and CD38 expression in the two populations from all donors is shown in the right panel. Differences between HIV− and HIV+ donors (C) were assessed by a Mann–Whitney U test. Comparisons between FcRγ− and conventional NK cells were made using a Wilcoxon signed rank test. *p < 0.05, **p < 0.01, ***p < 0.001. We have shown that NK cells from VS HIV+ individuals have higher expression of the lymphocyte activation marker CD38 and spontaneously degranulate ex vivo (28). We compared these parameters in both FcRγ− and conventional NK cells to determine whether our previous observations could be explained by the high prevalence of FcRγ− NK cells in HIV patients. Using an ex vivo whole-blood assay we confirmed NK cells from VS HIV patients degranulate at a higher rate than do those from HIV− control subjects, but the rate of spontaneous degranulation did not differ between FcRγ− and conventional NK cells (Fig. 4C). FcRγ− NK cells expressed low levels of HLA-DR, similar to conventional NK cells, but expressed less CD38 (Fig. 4D). These data suggest that increased NK cell activation in VS HIV+ individuals, measured phenotypically or via degranulation ex vivo, is not due to an increased proportion of FcRγ− NK cells in these individuals, as it is apparent in both this subset and in conventional NK cells. Because chronic HIV infection alters the NKG2A/NKG2C ratio on NK cells in patients who are CMV seropositive (25), we assessed NKG2A and NKG2C on FcRγ− and conventional NK cells. FcRγ− NK cells had lower NKG2A expression in most individuals (Fig. 5A), whereas NKG2C expression was equivalent in both populations (Fig. 5B). 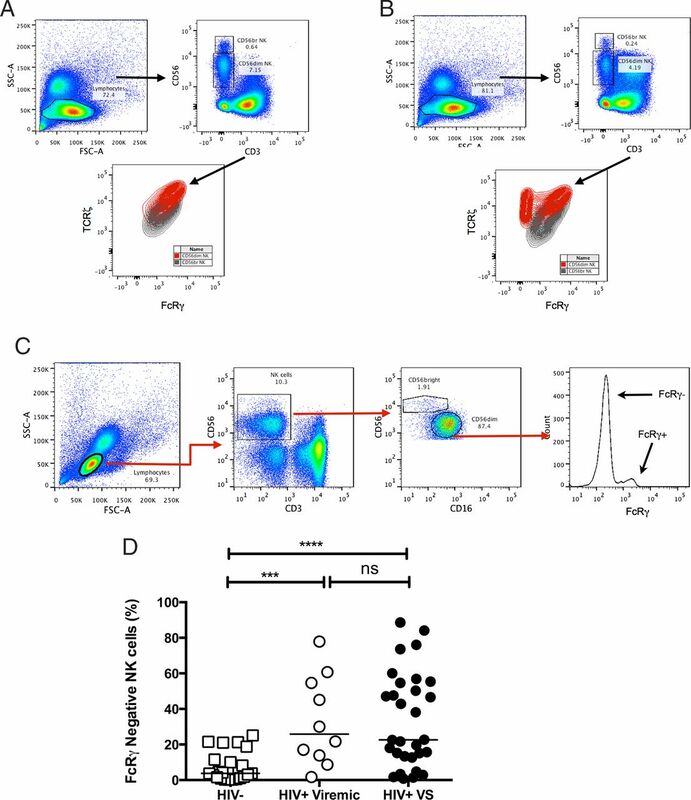 FcRγ− and conventional (FcRγ+) CD56dim NK cells were analyzed from eight VS HIV+ donors (chosen because they exhibited ∼50% FcRγ−CD56dim NK cells) and compared phenotypically using the following markers: (A) NKG2A, (B) NKG2C, (C) NKp30 and NKp46, (D) CD16, (E) CD56, (F) CD62L, (G) CD57, and (H) CD27. For each marker, contour plots of that marker versus FcRγ are shown for a representative donor (left panels), as are aggregate data comparing expression for all individuals (right panels). Where markers were present on all NK cells, expression between subsets was compared using MFI. Differences were assessed using a Wilcoxon signed rank test. *p < 0.05, **p < 0.01. Both FcRγ and TCRζ have been shown in transfected cell lines and using knockout mice to act as molecular chaperones for the receptors for which they transduce signals (31–35), but their role as chaperones in primary human NK cells is less clear. We assessed NK-activating receptors, as well as maturation and senescence markers, on FcRγ− and conventional NK cells from VS HIV+ patients. FcRγ− NK cells did not express NKp30 or NKp46 (Fig. 5C), consistent with a role for FcRγ as a chaperone for these NK-activating receptors. FcRγ− NK cells expressed CD16, but with lower mean fluorescence intensity (MFI) (Fig. 5D), whereas CD56 expression was comparable (Fig. 5E), which does not fit with the normal differentiation of CD56bright to CD56dim cells in which CD16 expression increases and CD56 expression decreases. CD62L, expressed on a population of less mature, polyfunctional CD56dim NK cells (36), was expressed on a minority of NK cells, but CD62L+FcRγ− NK cells had a lower MFI than did CD62L+ conventional NK cells (Fig. 5F). More FcRγ− NK cells expressed the maturation marker CD57 (37) but fewer expressed the TNFR family member CD27 (Fig. 5G and 5H, respectively). It was difficult to assess the phenotype of FcRγ− NK cells in HIV− control subjects, as the populations were small, but no differences were identified (Supplemental Fig. 4). In this study, we associate HIV infection with expansion of an FcRγ− NK cell population that lacks expression of the activating receptors NKp30 and NKp46. FcRγ− NK cells represent up to 90% of the total CD56dim NK cell pool in viremic HIV+ individuals and patients on cART for >6.5 y. Expansion of the FcRγ− NK cell population did not correlate with CD4 counts, nadir CD4 counts, plasma HIV RNA, or time on cART, as observed when we measured FcRγ expression in the total NK cell population (28). Hence, our data suggest that FcRγ− NK cell expansion is not due to HIV infection per se, nor is it a direct consequence of the immunological damage caused by HIV before cART. Our finding that FcRγ expression is decreased at the level of mRNA and protein suggests that the FcRγ− gene expression is reduced, rather than epitopes recognized by the FcRγ Ab used for intracellular flow cytometry being masked. Similar to an FcRγ− NK cell subset described in CMV-seropositive blood donors (30), the population we describe in the present study has enhanced ADCC activity relative to conventional NK cells despite lower expression of CD16, so CD16 expression is not invariably rate determining for ADDC activity. Because CD16 can signal via both FcRγ and TCRζ, ADCC signaling may be transduced by TCRζ in FcRγ-deficient cells and signaling via FcRγ and/or TCRζ may be rate determining. CD16 expression on NK cells is reduced in HIV+ individuals via ADAM17-dependent shedding (38, 39) but it is not clear to what extent ADAM17 reduces CD16 expression in FcRγ− NK cells and how much loss of CD16 is due to loss of FcRγ chaperone function. NK cells from ∼40% of individuals express the activating Fcγ receptor, CD32c, which can mediate ADCC via its own cytoplasmic ITAM motif (40). It is possible that differential expression of this receptor between NK subsets might account for the higher ADCC activity of the FcRγ− population observed in some HIV patients, but the has not been examined in the present study. The expansion of a population of NK cells with increased ADCC activity in HIV+ individuals has relevance to vaccine strategies aimed at generating ADCC-promoting Ab responses (41–43). Other NK cell abnormalities have been associated with CMV coinfection in HIV+ individuals. In particular, NK cells displayed skewed expression of NKG2A and NKG2C that normalized after 24 mo cART (25). Given the presence of FcRγ− NK cells in CMV-seropositive individuals (30), we considered whether this is the same population. Although FcRγ− NK cells generally expressed low levels of NKG2A, this is not true for all individuals. Similarly, NKG2C expression was similar to that on conventional NK cells within any individual. Thus, although there is overlap with the NK cell subset expanded in CMV HIV-coinfected individuals, these are not congruent subsets. FcRγ− NK cells in HIV+ individuals share many characteristics with mature CD56dim NK cells that lose NKG2A, have lower proliferative capacity, and acquire CD57 and KIR expression (37). Unlike these cells, FcRγ− NK cells do not lose CD62L expression, a marker that defines polyfunctional and less mature CD56dim NK cells (36). The presence of these cells in VS HIV+ individuals, their high ADCC activity, and their high CD56 expression are not consistent with their being precursors to dysfunctional CD56− NK cells that accumulate in viremic HIV individuals (17). Whether they represent a terminally differentiated CD56dim NK cell population that normally does not accumulate in the periphery of healthy individuals remains to be determined. Although FcRγ− NK cells have been associated with CMV seropositivity in HIV− individuals (30), all of the HIV+ individuals used in this study were seropositive for CMV, so this alone cannot explain the variation in prevalence of FcRγ− NK cells in the setting of HIV infection. Analysis of the plasma from five VS HIV+ individuals who had no or very low FcRγ− NK cells and five individuals with a very high proportion of FcRγ− NK cells showed no detectable CMV viral load using standard clinical assays (data not shown). We next examined the relationship between FcRγ− NK cells and CMV infection in our HIV patients and control subjects by correlating their proportion with levels of CMV Abs. There was a significant association in HIV− individuals that was not evident in HIV+ individuals so, whereas CMV reactivation may drive low levels of FcRγ− NK cell expansion in the general population, other factors are responsible for expansion of this subset in HIV-infected individuals. Rather, the correlation with levels of CXCL10 in both HIV− and HIV+ individuals implicates chronic inflammation. In support of this, we have detected high proportions of FcRγ− NK cells in heart transplant patients who receive prophylactic valganciclovir to inhibit CMV reactivation (A.C. Hearps, unpublished), suggesting that the subset is not expanded as a result of current CMV reactivation. We have shown that NK cells from viremic and VS HIV+ individuals are phenotypically activated and degranulate spontaneously (28). Our observations of increased NK cell CD38 expression in viremic HIV+ individuals have been confirmed (44) and associated with HIV disease progression. Significantly, our observation that NK activation is elevated in VS HIV+ individuals has been supported by evidence that it also occurs in elite controllers (44). We asked whether increased NK activation and degranulation could be explained by expansion of FcRγ− NK cells, but there was no difference in spontaneous degranulation. Contrary to expectation, FcRγ− NK cells expressed lower levels of CD38 than did conventional NK cells. Although CD38 expression is used as a lymphocyte activation marker, its lower expression on FcRγ− NK cells does not necessarily imply that these cells are less activated than conventional NK cells, as spontaneous degranulation was observed in these cells. CD38 is an NADP glycohydrolase whose product ADP ribose regulates Ca2+ signaling in lymphocytes (45). In NK cells, CD38 associates with and transduces signals via TCRζ and FcRγ (46), so the decreased expression of CD38 in FcRγ− NK cells may reflect decreased chaperone function. Continued activation of NK cells in VS and elite controller HIV+ individuals adds to the monocyte activation data we have published (2, 3) demonstrating that the innate immune system is activated in these individuals. Loss of NKp30 and NKp46 expression has been reported in HIV infection (47–49) but the mechanism underlying their loss is not known. Our data suggest that expansion of FcRγ− NK cells in HIV+ individuals contributes to this loss and that it persists despite successful cART. Although NKp30 associates with TCRζ (50) and signals via TCRζ-dependent mechanisms (51), our data are consistent with a role for FcRγ as a molecular chaperone for NKp30. Similarly, NKp46 associates with TCRζ (52) but does not require it for surface expression (53), which is consistent with a role for FcRγ as the molecular chaperone for this receptor. NKp30 can mediate recognition and promote killing of fungal pathogens that cause AIDS-defining illnesses such as Cryptococcus and Candida spp. (54). Thus, expansion of FcRγ− NK cells in viremic HIV patients with low CD4 T cell counts may increase the susceptibility of such individuals to fungal opportunistic infections, although the persistence of these cells does not appear to maintain susceptibility to fungal infections on cART. In summary, a unique subset of FcRγ− NK cells associated with CMV Ab levels in the general population is expanded in HIV-infected individuals and can represent up to 90% of CD56dim NK cells. In chronically infected HIV+ individuals their expansion correlates with plasma markers of innate immune activation. The long-term health consequences of expansion of FcRγ− NK cells lacking NKp30 and NKp46 need to be determined. Given the importance of these receptors for immunosurveillance of tumors, the population may contribute to increased incidence of cancer in HIV+ patients receiving cART (55). We thank Dr. Ilia Voskoboinik for providing rituximab and Raji cells used in this study. Janine Roney and the research nurses at the Clinical Research Unit, Alfred Hospital are thanked for help in patient recruitment and obtaining patient metadata. We gratefully acknowledge the participation of the individuals who consented to this study. This work was supported by National Health and Medical Research Council Project Grant 1048536 (to A.J.). P.P. and F.S.A. received financial support from the Medical Research Foundation of Royal Perth Hospital, Western Australia. This work was also supported by the Victorian Operational Infrastructure Support Program.
. 2014. Trends in underlying causes of death in people with HIV from 1999 to 2011 (D:A:D): a multicohort collaboration. Lancet 384: 241–248.
. 2012. HIV infection induces age-related changes to monocytes and innate immune activation in young men that persist despite combination antiretroviral therapy. AIDS 26: 843–853.
. 2013. Age-associated changes in monocyte and innate immune activation markers occur more rapidly in HIV infected women. PLoS ONE 8: e55279.
. 2006. Microbial translocation is a cause of systemic immune activation in chronic HIV infection. Nat. Med. 12: 1365–1371.
. 2014. Innate immunity cell activation in virologically suppressed HIV-infected maraviroc-treated patients. AIDS 28: 1071–1074.
. 2013. Aspirin attenuates platelet activation and immune activation in HIV-1-infected subjects on antiretroviral therapy: a pilot study. J. Acquir. Immune Defic. Syndr. 63: 280–288.
. 2011. Soluble CD163, a novel marker of activated macrophages, is elevated and associated with noncalcified coronary plaque in HIV-infected patients. J. Infect. Dis. 204: 1227–1236.
. 2011. Plasma levels of soluble CD14 independently predict mortality in HIV infection. J. Infect. Dis. 203: 780–790.
. 2014. Evidence for innate immune system activation in HIV type 1-infected elite controllers. J. Infect. Dis. 209: 931–939.
. 2007. ART suppresses plasma HIV-1 RNA to a stable set point predicted by pretherapy viremia. PLoS Pathog. 3: e46.
. 2010. Evidence of persistent low-level viremia in long-term HAART-suppressed, HIV-infected individuals. AIDS 24: 2535–2539.
. 2011. Valganciclovir reduces T cell activation in HIV-infected individuals with incomplete CD4+ T cell recovery on antiretroviral therapy. J. Infect. Dis. 203: 1474–1483.
. 2013. Effect of cytomegalovirus-induced immune response, self antigen-induced immune response, and microbial translocation on chronic immune activation in successfully treated HIV type 1-infected patients: the ANRS CO3 Aquitaine Cohort. J. Infect. Dis. 207: 622–627.
. 2014. Human innate lymphoid cells. Blood 124: 700–709.
. 2004. NK cell compartments and their activation by dendritic cells. J. Immunol. 172: 1333–1339.
. 2002. Selective depletion of CD56dim NK cell subsets and maintenance of CD56bright NK cells in treatment-naive HIV-1-seropositive individuals. J. Clin. Immunol. 22: 176–183.
. 2005. Characterization of CD56−/CD16+ natural killer (NK) cells: a highly dysfunctional NK subset expanded in HIV-infected viremic individuals. Proc. Natl. Acad. Sci. USA 102: 2886–2891.
. 2010. CD56 negative NK cells: origin, function, and role in chronic viral disease. Trends Immunol. 31: 401–406.
. 2009. Expansion of functionally skewed CD56-negative NK cells in chronic hepatitis C virus infection: correlation with outcome of pegylated IFN-α and ribavirin treatment. J. Immunol. 183: 6612–6618. 2008. Up on the tightrope: natural killer cell activation and inhibition. Nat. Immunol. 9: 495–502.
. 2011. HIV inhibits early signal transduction events triggered by CD16 cross-linking on NK cells, which are important for antibody-dependent cellular cytotoxicity. J. Leukoc. Biol. 89: 149–158.
. 2005. Sequential deregulation of NK cell subset distribution and function starting in acute HIV-1 infection. Blood 106: 3366–3369.
. 2003. Natural killer cells in HIV-1 infection: dichotomous effects of viremia on inhibitory and activating receptors and their functional correlates. Proc. Natl. Acad. Sci. USA 100: 15011–15016.
. 2005. Switch from inhibitory to activating NKG2 receptor expression in HIV-1 infection: lack of reversion with highly active antiretroviral therapy. AIDS 19: 1761–1769.
. 2010. Chronic HIV-1 viremia reverses NKG2A/NKG2C ratio on natural killer cells in patients with human cytomegalovirus co-infection. AIDS 24: 27–34.
. 2002. Normalization of natural killer cell function and phenotype with effective anti-HIV therapy and the role of IL-10. AIDS 16: 1251–1256.
. 2010. Decreased NK cell FcRγ in HIV-1 infected individuals receiving combination antiretroviral therapy: a cross sectional study. PLoS ONE 5: e9643.
. 2012. Virologically suppressed HIV patients show activation of NK cells and persistent innate immune activation. J. Immunol. 189: 1491–1499.
. 2008. Robust NK cell-mediated human immunodeficiency virus (HIV)-specific antibody-dependent responses in HIV-infected subjects. J. Virol. 82: 5450–5459.
. 2013. Cutting edge: antibody-dependent memory-like NK cells distinguished by FcRγ deficiency. J. Immunol. 190: 1402–1406.
. 1989. Mechanisms for regulating expression of membrane isoforms of FcγRIII (CD16). Science 246: 1608–1611.
. 2005. Cotranslational endoplasmic reticulum assembly of FcεRI controls the formation of functional IgE-binding receptors. J. Exp. Med. 201: 267–277.
. 2013. Mincle, the receptor for mycobacterial cord factor, forms a functional receptor complex with MCL and FcεRI-γ. Eur. J. Immunol. 43: 3167–3174.
. 2003. Dendritic cell immunoactivating receptor, a novel C-type lectin immunoreceptor, acts as an activating receptor through association with Fc receptor gamma chain. J. Biol. Chem. 278: 32645–32652. 1996. Multiple loss of effector cell functions in FcRγ-deficient mice. Int. Rev. Immunol. 13: 369–381.
. 2010. CD62L expression identifies a unique subset of polyfunctional CD56dim NK cells. Blood 116: 1299–1307.
. 2010. Expression patterns of NKG2A, KIR, and CD57 define a process of CD56dim NK-cell differentiation uncoupled from NK-cell education. Blood 116: 3853–3864.
. 2009. Matrix metalloprotease inhibitors restore impaired NK cell-mediated antibody-dependent cellular cytotoxicity in human immunodeficiency virus type 1 infection. J. Virol. 83: 8705–8712.
. 2013. NK cell CD16 surface expression and function is regulated by a disintegrin and metalloprotease-17 (ADAM17). Blood 121: 3599–3608.
. 1998. Expression of functional CD32 molecules on human NK cells is determined by an allelic polymorphism of the FcgammaRIIC gene. Blood 91: 2369–2380.
. 2005. Vaccine-elicited antibodies mediate antibody-dependent cellular cytotoxicity correlated with significantly reduced acute viremia in rhesus macaques challenged with SIVmac251. J. Immunol. 174: 2185–2189.
. 2009. Fc receptor-mediated antiviral antibodies. Curr Opin HIV AIDS 4: 388–393.
. 2014. Structural definition of an antibody-dependent cellular cytotoxicity (ADCC) response implicated in reduced risk for HIV-1 infection. J. Virol. 88: 12895–12906.
. 2014. Activation of NK cells is associated with HIV-1 disease progression. J. Leukoc. Biol. 96: 7–16.
. 2008. Evolution and function of the ADP ribosyl cyclase/CD38 gene family in physiology and pathology. Physiol. Rev. 88: 841–886.
. 2001. Signaling through CD38 induces NK cell activation. Int. Immunol. 13: 397–409.
. 2003. The impaired NK cell cytolytic function in viremic HIV-1 infection is associated with a reduced surface expression of natural cytotoxicity receptors (NKp46, NKp30 and NKp44). Eur. J. Immunol. 33: 2410–2418.
. 2009. Elevated natural killer cell activity despite altered functional and phenotypic profile in Ugandans with HIV-1 clade A or clade D infection. J. Acquir. Immune Defic. Syndr. 51: 380–389.
. 2013. Successfully treated HIV-infected patients have differential expression of NK cell receptors (NKp46 and NKp30) according to AIDS status at presentation. Immunol. Lett. 152: 16–24.
. 1999. Identification and molecular characterization of NKp30, a novel triggering receptor involved in natural cytotoxicity mediated by human natural killer cells. J. Exp. Med. 190: 1505–1516.
. 1998. NKp44, a novel triggering surface molecule specifically expressed by activated natural killer cells, is involved in non-major histocompatibility complex-restricted tumor cell lysis. J. Exp. Med. 187: 2065–2072.
. 1998. Molecular cloning of NKp46: a novel member of the immunoglobulin superfamily involved in triggering of natural cytotoxicity. J. Exp. Med. 188: 953–960.
. 2013. The NK receptor NKp30 mediates direct fungal recognition and killing and is diminished in NK cells from HIV-infected patients. Cell Host Microbe 14: 387–397.
. 2008. NK cell function in HIV-1 infection. Curr. HIV Res. 6: 433–440.